Another section from one of my Civil War texts, this dealing with the Emancipation Proclamation. From the beginning of the war many Northerners, especially abolitionists and radical Republicans believed that “as the “cornerstone” of the confederacy (the oft-cited description by the South’s vice-president, Alexander H. Stephens) slavery must become a military target.”  When some Union generals made their own attempts at issuing emancipation orders, Lincoln countermanded them for exceeding their authority. Lincoln resisted the early calls of the abolitionists to make that a primary war goal for very practical reasons, he had to first ensure that the Border Slave States did not secede, something that would have certainly ensured that the Union would not survived. As a result in the first year of the war, Lincoln “maneuvered to hold Border South neutrals in the Union and to lure Union supporters from the Confederacy’s Middle South white belts. He succeeded on both scores. His double success with southern whites gave the Union greater manpower, a stronger economy, and a larger domain. These slave state resources boosted free labor states’ capacity to should the Union’s heavier Civil War burden.”  His success in doing this was instrumental in enabling him to turn to emancipation in 1862. 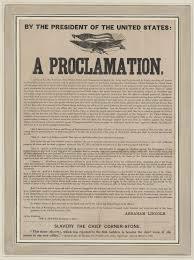 Finally, some twenty months after Fort Sumter fell and after nearly two years of unrelenting slaughter culminating in the bloody battle of Antietam, Abraham Lincoln published the Emancipation Proclamation. Emancipation was a tricky legal issue for Lincoln as “an executive order of emancipation would be beyond the powers of the president, but not, Lincoln concluded, if such an order were issued as furtherance of the executive’s war powers.”  Lincoln had desired to issue the order during the summer and sounded out elected officials and soldiers as to his plan. After the Battle of Antietam, President Lincoln issued the Preliminary Emancipation Proclamation. This document served as a warning to the leaders of the South, and insisted that there was much more at stake in their rebellion unless they surrendered; their slaves, the very “property” for which the seceded. The document “warned that unless the South laid down its arms by the end of 1862, he would emancipate the slaves.”  This was something that they could not and would not do, even as their cities burned and Confederacy collapsed around them in 1864. For Lincoln the Emancipation Proclamation was something that he believed was something that he had to do, and he believed that it would be the one thing that he did in life that would be remembered. He had long been convicted of the need for it, but timing mattered, even six months before it might have created a political backlash in the North which would have fractured support for the war effort, and in this case timing and how he made the proclamation mattered. The Emancipation Proclamation had military, domestic political, and diplomatic implications, as well as moral implications for the conduct of the war. The military implication would take some time to achieve but were twofold. First, Lincoln hoped that the Emancipation Proclamation would encourage former slaves, as well as already free blacks in the North to join the Union cause and enlist to serve in the Federal Army. The act would vest African Americans in the Union’s cause as little else could, and at the same time begin to choke-off the agricultural labor force that provided the backbone of the Confederate economy. Frederick Douglass eloquently made the case for African Americans to serve in July 1863, telling a crowd in Philadelphia, “Do not flatter yourself, my friends, that you are more important to the Government than the Government is to you. You stand but as a plank to the ship. This rebellion can be put down without your help. Slavery can be abolished by white men: but Liberty so won for the black man, while it may leave him an object of pity, can never make him an object of respect…. Young men of Philadelphia, you are without excuse. The hour has arrived, and your place is in the Union army. Remember that the musket – the United States musket with its bayonet of steel – is better than all the parchment guarantees of Liberty. In you hands the musket means Liberty…”  By the end of the war over 180,000 African American men would serve as volunteers in the United States Army. Politically the proclamation would the diplomatic purpose by isolating the Confederacy from European assistance. This it did, after the proclamation public sentiment, especially among Europe’s working classes turned solidly against the Confederacy. Domestically it would break-ground for the Thirteenth Amendment, which Lincoln, the pragmatic lawyer was needed to actually abolish slavery. Morally, it would serve as the guarantee of The United States Government’s public, irrevocable pledge of freedom to African Americans if the North won the war. However, it would take another two years, with the Confederacy crumbling under the combined Federal military onslaught before Lincoln was able to secure passage of the Thirteenth Amendment to the Constitution in January 1865. The amendment abolished slavery and involuntary servitude throughout the country, as well as nullified the fugitive slave clause and the Three-Fifths Compromise. It would be followed after Lincoln’s death by the Fourteenth Amendment which reversed the result of the Dred Scott decision and declared that all people born in the United States were citizens and entitled to the rights of citizenship. During the Grant administration the Fifteenth Amendment was passed, and this finally extended to African American men, the right to vote in every state. Though limited in scope, the Emancipation Proclamation had more than a domestic military, social and political effect. It also had an effect on foreign policy which ensured that Britain, and thereby France would not intervene in the war on behalf of the Southern Confederacy. It stopped all British support for the Rebels to include seizing warships that had been contracted for by Confederate agents that were building or being fitted out in British Yards. Likewise the British rejected various proposals of Emperor Napoleon III to intervene in the war in late 1862 and during the summer of 1863. The effort of the Copperheads and the peace party to was soon crushed under the military successes of William Tecumseh Sherman’s armies in Georgia. This was especially true of the capture of Atlanta, which was followed by Sherman’s march to the sea and the Carolinas. Additionally the naval victory of David Farragut’s fleet at the Battle of Mobile Bay served to break the stranglehold that the Copperheads were beginning to wield in Northern politics. These efforts helped secure Lincoln’s reelection by a large margin in the 1864 presidential election over a divided Democratic opposition, whose presidential nominee McClellan could not even endorse his party’s platform.